With any concrete repair or resurfacing project, identifying the source of the problem, developing a scope, selecting materials and method for repair are crucial factors to ensure success and achieve the desired end product. Measures must be taken as well to ensure that the problem source is addressed to prevent future re-occurrence. 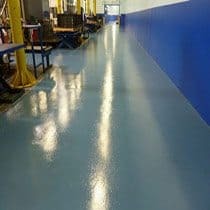 ATD Concrete Coatings is one of the largest contractors in the North Texas area, having completed several projects over the past 30 years. We are experienced professionals, and our commitment to prompt and accurate work has earned us a exceptional reputation in the industry. From revitalizing industrial laboratories, warehouses, pharmaceutical facilities and kitchens, we are equipped to handle a range of services while adhering to local code enforcements and industry standards.